If you like to take bath in an omnipresent sub-bass the London based DJ and producer El-B will take you out for a deep swim. As one of the first producers he introduced a dark edge into the UK Garage scene and defined a gloomy Dubstep style with his label Ghost Records. As a DJ he likes to see the dancefloor jam-packed and whips the crowd with some 2step, Garage, and House rhythms too. 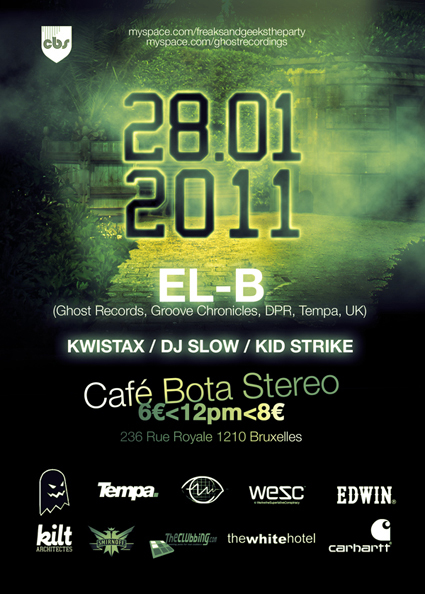 The local support comes from Kwistax, DJ Slow, and Kid Strike, who will warm up and cool down the bash. So just in case you like it wonky: come to Café Bota Stereo and pick up your dosis of bass adventure.